That's a whole lot of coins collected! The coin rush is on! If you live in Europe or North America and have enabled SpotPass on New Super Mario Bros. 2 you should have recently received your first update to let you know how many coins have been collected by Mario fans globally. We reported on this a few days ago when Japanese players got their first update, at that time the global total was a mere 36.5 billion. 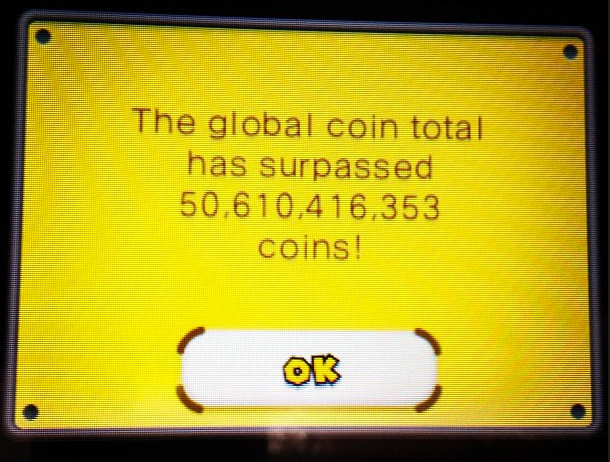 It has now increased to a whopping 50,610,416,353 coins which will no doubt be turning Wario green with envy. Do let us know if you have received a similar SpotPass message. What are your guesses for next week's global coin total? And I've contributed an embarrassingly pitiful number of coins to that. Much like real life, where I've contributed an embarrassingly pitiful number of dollars to the economy! Life does indeed imitate art! This is kind of fun. They should create site where you can watch the total getting higher and higher, either that or a 3DS app. I got this alert yesterday and I'm in North America, and the amount seems identical. @HADAA Of course, it is the global count ..
Aw, no typo in that screen? Boom! That's a lot of coins. I've contributed 100,000 to that and climbing. O and I can confirm I received the same notice. Roger that, over and out. I will say, however, that you can earn boat-loads of coins doing the coin-rush challenges - my record so far is just over 2500 coins, and getting to the top of the flagpole will double your score. Also, you can unlock the elusive "Rainbow Worlds" if you get double digits on the clock that match your world number. Their basically giant coin-heavens! You can also try collecting a Golden Flower and then playing an underworld area full of bricks. Maybe with 50 billion coins, or better yet 50 trillion, the US economy can pay off the national deficit. What's the current global exchange rate on Mario coins to USD? @StarDust Yea I finished the main game with only 50,000 coins and was thinking that the grind to 1,000,000 would kill me, but after playing coin rush mode for a day I am at 100,000. My record is 7,000 and yes hitting the flag pole doubles the amount of coins you get so make sure you reach the end of the level with enough time to carefully time your jump. Each subsequent flagpole becomes more important because you don't just double the coins you get from that level but also from the previous levels. Yesterday I went from like 150K to 450K just from Coin Rush. Helps that I set up my systems to tag each other: you get all the coins for a streetpass record just for racing against it and completing it, plus the coins you earn doing it, plus 1000 coins if you beat the record. It looks like it's going to be fairly easy to reach the million coins actually, especially once a lot of people start StreetPassing huge records. I feel like the total would be more meaningful if we actually had to earn each coin one by one, rather than getting heaps of them at once and coins getting multiplied various ways. Now if each gold coin were $1 (think of Sacajawea's), the world of NSMB2 players would only need to do this 320 more times or so to pay the American government debt. Wow, I'm considering trying out the game. My brother likes it. Did we just get a mobile site? My kids are probably getting this for Christmas, I hope somebody still cares then. 150,000 of those coins belong to me! Coin Rush is best way to get coims. My record is 14,000. So I have to play it about 60-70 times to get a million. Too easy! I only have 113,186 coins at the moment, with nothing else to do besides coin rush. Seems like it might be a little tedious to get the 1,000,000. Wow thats alot of coins, Wario would be proud. Are those only from internet enabled systems? Just good to see people are buying/playing the game. This should be a game that sells 3DS. Whether or not you think there has been too much Mario, if it means more 3DSs in people's hands, then Mario is doing his job which helps bring more games to us in the end. I contributed around $75k to this! I wonder if we can all max out the coin count, how many coins is that? @LordOtakWiiU In Japan alone NSMB2 sold almost a million copies, so multiply that by the max coin count which is 10 million (minus 1), you get up to 10 trillion coins just in Japan. I don't have the global sales figure, but I doubt most of us would max out anyway. Currently have around 100,000 coins. 12,000 is my CR record, but it's easy to max at 30,000 by spamming the infinite 1-UP trick as Gold Mario in the first level, then get three 2x multipliers. @Metabble_King I'm still not sure how to do that though - I thought the Koopa shell would break after you've stepped on it 20 times as Gold Mario (so it's not truly infinite in CR mode)? Do I need to go back the pipe and let it respawn? @FluttershyGuy lol! I feel your pain, brutha! Got 875000 coins atm, not feeling to grind any further right now lol. My CR record is 18700 Coins legit without any 1 up tricks or something like that which is acceptable to me. @grumblegrumble That sounds pretty interesting and fun!